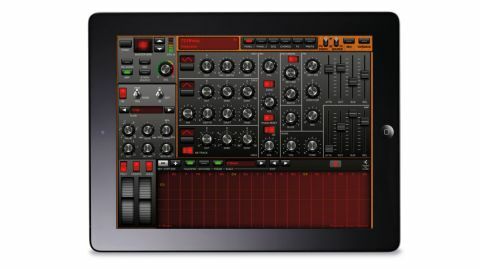 A comprehensive, tactile synth for the iPad that's capable of creating some truly excellent sounds. Massive feature list. Incredible sounds. Feels like a performance instrument. At this price, very little. Comprising two three-oscillator virtual analogue synths that can be run independently of each other (ie, a bass on one and a pad on the other) or stacked for a whopping six-oscillator combo, Magellan certainly makes no 'mobile' compromises. "Magellan feels like a performance instrument, thanks in no small part to the expressive Touchpad playing surfaces"
The feature list is immense, highlights including unison, oscillator drift, separate FM modules, ring mod, routable dual filters with 11 types, two LFOs for each synth with four mod targets apiece, a freely assignable XY pad, chord mapping, arpeggiator, polyphonic step sequencer, a roster of very capable effects modules, audio recording and export, 242 quality presets, MIDI learn... and the sound. Magellan sounds truly incredible, particularly in six-oscillator 'coupled' mode - beefy and phat at the bottom; energetic, lively and bright at the top. It feels like a performance instrument, thanks in no small part to the expressive Touchpad playing surfaces, which can be used instead of the two traditional keyboards; but the various playback modifiers (arp, step sequencer, etc) make it easy for anyone to build complex parts with ease.